After a very early day game in Allentown, Pennsylvania the Bulls were off to Pawtucket, Rhode Island. There Jim Patterson flew in from “extended spring training” for his second start of the year. He did just fine. And he was followed by young Jhan Marinez (terrific), Bryce Stowell (premier middle reliever), and Ronald Belesario. Meanwhile the Bulls hit three home runs, something they’ve only done once before this year. The first was a game-opening hit by Taylor Motter. The second was a three-run affair by J.P. Arencibia. And the third was a solo shot by Corey Brown. We saw the very ugly, and endlessly replayed, play by Pawsox catcher Humberto Quintero. Mikie Mahtook was on second and attempted a steal of third. Luke Maile was at bat. Maile simply stood in the box and Quintero launched his throw to 3B right into Maile’s gut. Not OK, and Maile obviously felt it. But much worse was Quintero acting as if it was Maile’s fault. Would expect better from a 35 year-old veteran. Then things got very testy after a collision between Quintero and Hak-Ju Lee at second base later on in the game. It was May 1 and the speed of game changes are in effect. A Pawtucket batter had a strike called in him because he was not in the box when he should have been. Matt Andriese, who had five appearances with the Rays (two starts) has been optioned to the Bulls to make room for Alex Colome. Probably will show up soon. Grant Balfour, a once great closer, and former Bull, has signed a minor league deal with the Rays and will be coming to the Bulls to see if he can regain the form he had with the Rays and the Athletics. The Australian should be fun to watch. Everett Teaford, who went up a couple of days ago, is on his way back. I don't think I've mentioned that Kirby Yates has gone on the disabled list. Fits with what we've seen since he came back to the Bulls. This is one way to look at the Bulls’ hitting performance. I’m using OPS (on base percentage + slugging) as a metric. That’s not my favorite batting stat, but for my purposes of trying to discern team trends, it’s OK.
What is OPS? Well, it’s a combination of numbers you see on the scoreboard at each game. It is an effort to measure a player’s batting skill beyond batting average. It starts with On Base Percentage, essentially how often a player gets on base when he comes to bat — hit, walk, hit by pitch. And then you add to it the Slugging Average, which is the number of bases per at bat. One way to help understand slugging is that if you look up on the scoreboard and see a batting average that’s the same as the slugging average, it means he’s only hit singles so far this year. There’s another stat I like better, called Weighted On Base Average, and I plot them both. But as far as trends go, I’m not seeing much difference. This plots the OPS for each of the last 15 games. Included is the International League average over the last 3 years. The slight upward trend is a good thing. 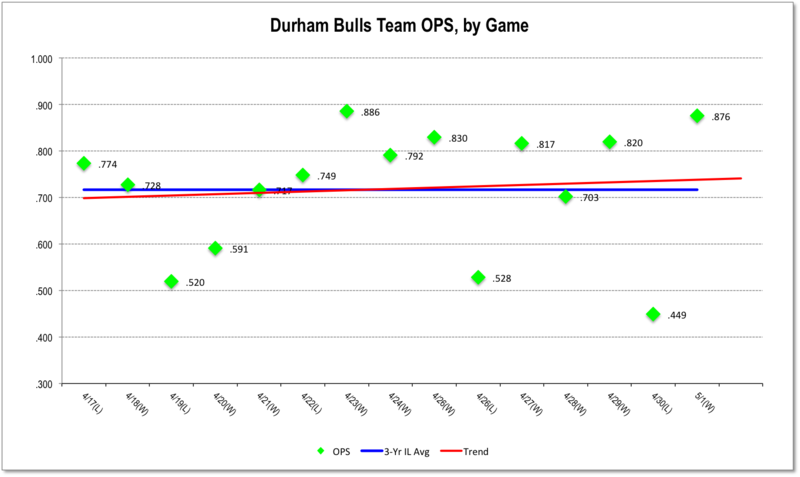 The Bulls’ overall OPS on the season is .690, which ranks them 6th out of 14 teams in the league.